Artificial grass has become the new ‘must have’ item for your garden. But why has it become so popular overnight and where did the idea come from? Artificial grass has actually been around since the 1960’s, predominantly being used for football pitches. The first well known installation of a full sized pitch was at the Houston Astrodome in 1965 and was then known as Chemgrass. By 1966 the a major league baseball team, known as the Houston Astro’s were playing on this surface, so it was renamed ‘Astroturf’, a word that now appears in the English Dictionary. An official patent was applied for in 1967. This surface was a tightly curled nylon fibre, which was woven into a foam backing and has since been referred to as the ‘first generation’ of synthetic football surfaces. The second generation of artificial grass was introduced in the 1970’s and was known as the ‘shag turf’. The new yarns were made of a less abrasive polypropylene material and its tufts were spread widely apart in order to mimic the appearance of natural grass. Although this concept provided extremely popular for multi-sports pitches it never really took off for football. The ball behaviour and playing characteristics did not match the capabilities of natural grass. Carpet burns and serious injuries led to many pitches being uplifted and an eventual ban from English Professional Football. Clubs like QPR, Preston North End, Luton and Oldham, who had installed such pitches in the early 1980’s, removed their surfacing and returned to natural grass. By the mid 1990’s a third generation of artificial turf was appearing around the globe. It was now being made with a new polymer know as polyethylene, which was softer than its predecessors. This new turf also featured longer fibres, which were combined with a curled ‘dead grass’ thatch, creating a much more realistic appearance to the finished article. For sports applications, soft infills were introduced to the synthetic grass industry, which added extra comfort and put less stress on player’s joints, yet still provided adequate foot traction for sport. Artificial grass is now accepted for football around the world and is becoming extremely popular for numerous other applications. Artificial grass actually has a history of nearly 70 years in the UK, first being made Cumbria for fruit and veg stalls and grave surrounds. In the early 1980’s a manufacturing plant was set up in Preston, Lancashire, making a selective number of products mainly for the football and multi-sports pitch market. Verde Sports Ltd, set up in 1988 after purchasing a company called Scana Leisure Surfaces, who installed synthetic sports pitches out of needle-punched carpeted surfacing. Verde immediately started to introduce the use of artificial grass for golf, cricket, tennis, bowling green banks and various leisure surfaces. By 1990 artificial grass was regularly being used around holiday parks for covering caravan verandas to make them less slippery. 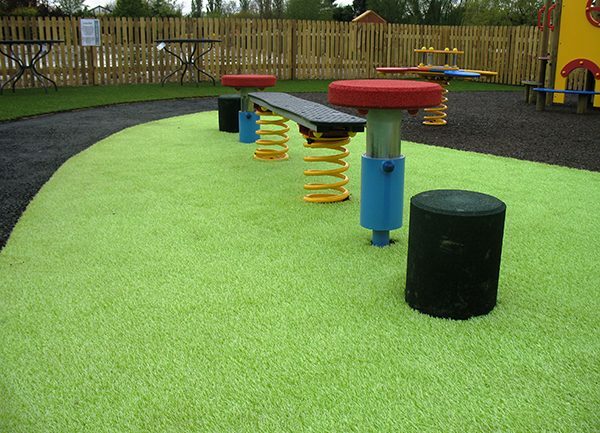 Children’s Nursery Schools soon caught on to the idea and fitted sand infilled surfaces, over a suitable shock pad, into their playgrounds. Verde’s first private lawn was installed in the summer of 1990 and was only replaced 20 years later for a cricket practice strip in the same garden. By the beginning of the 21st Century the internet was born. Verde started to adapt their range of sports products, to become more suitable and attractive to the domestic landscape market. They launched a website and started to sell grass for gardens around the UK. In 2001, Verde took a bold step and decided to sell their range of grasses to garden centres across the UK, offering merchandising, product and concept training and basically encouraging the promotion of this new idea on a much larger scale. Verde exhibited at GLEE, an exhibition that, at the time spanned over 9 halls. Within their first year Verde had over 150 garden centres selling grass for them and within the next 12 months many had decided to stock at least 2 versions to increase their potential sales. By 2004 Verde had launched a new type of artificial grass, their Verdeluxe. It was the first of its kind to be offered to the landscape market and it incorporated softer polyethylene fibres and a thatched base to create a much more natural appearance. Verde immediately started to export to countries such as Dubai, Cyprus and the Canaries where grass was difficult to grow. Around this time, the rest of the world had started to invest heavily into the design of new yarns to be used predominantly for the landscape market. Single strand monofilaments and new texturizing procedures meant that combining yarns of different heights, shapes and colours were possible. In 2010 Verde launched a new product known as ‘Verdelawn’ which capitalized on this concept. It was an immediate winner and was launched out to Builders Merchants to be wholesaled around the UK. Many new products have since been launched such as Groovy Grass, Verde Prime and other vibrant coloured grasses. Verde Garden Grass and Verde Home turf are relatively new additions to our landscape range and we continue to work on new developments all the time. By 2015 the world went crazy with artificial grass. China and the Far East went into mass production, mainly of relatively cheap alternatives for the landscape market. Small rolls are now sold via supermarkets to pick up and put in your shopping basket. Carpet Stores, Builders Merchants, Garden Centres and Numerous other outlets, wholesale large rolls for landscapers and private customers to collect and take away. You can buy a piece of artificial grass of any size on the internet but very few people are able to quickly tell the good stuff from the cheap imitations’. So what next. 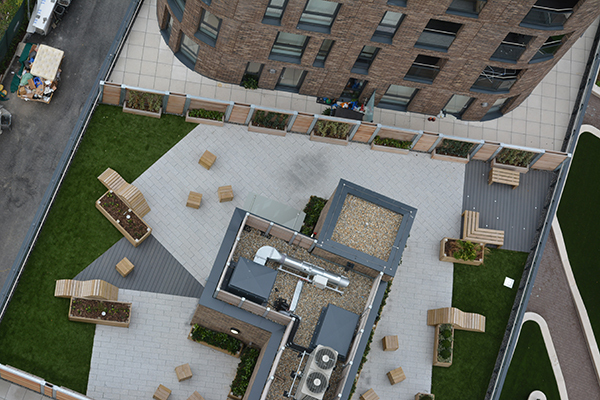 Verde have always prided themselves of manufacturing in the UK and are currently in the process of launching a 100% UK manufactured artificial grass for the landscape market. Joining together with a brand new production plant in Scotland, Verde have redesigned their popular Verde Lawn. The yarn will be extruded in Scotland, it will be tufted into artificial grass in Lancashire and then coated with a latex backing which is manufactured in Manchester. The New Verdelawn will have a 35mm pile height, be lovely and soft, yet retain its well-known resilient characteristics. It will not be cheap but it will be durable, heavy duty, look extremely realistic and will now be made 100% in the UK.